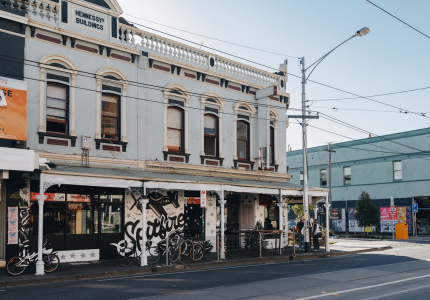 Melbourne’s best new restaurant is hiding on a quiet residential street in Yarraville. 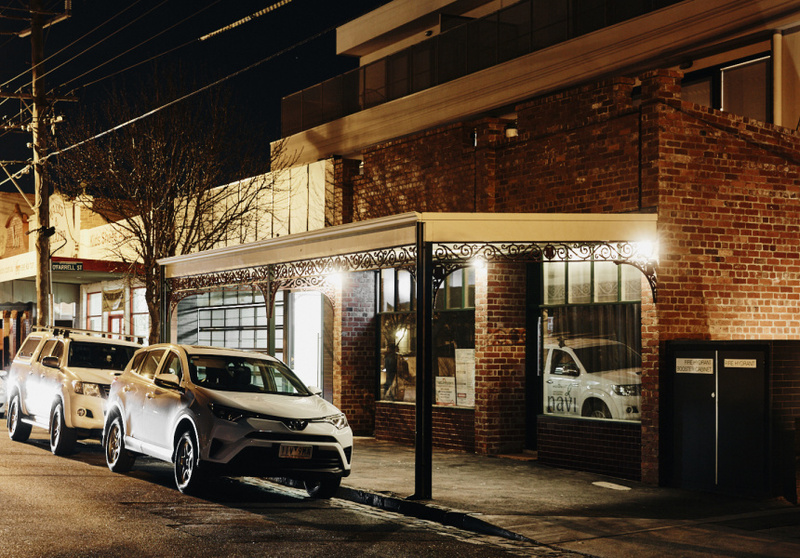 Typically, it’s living room lights that shine through the curtains on Gamon Street in Yarraville. From behind one gauzy grey set, though, comes the glow of Navi, a new restaurant by chef Julian Hills. 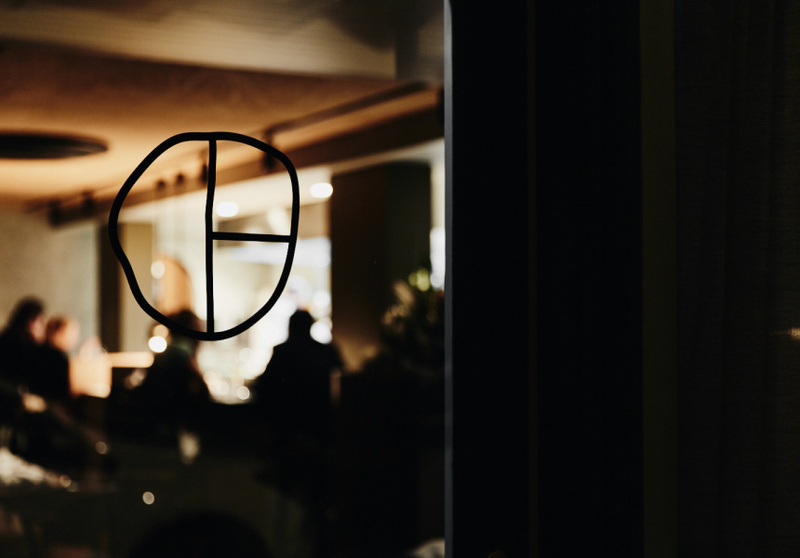 Beneath a corrugated and wrought-iron awning is the door to Hills’s first restaurant, where rigorous European technique meets native ingredients and Eastern philosophy. Inside, there are only 25 seats. This allows Hills to use produce that may only be available for a short time, or in short supply, from small local farms. 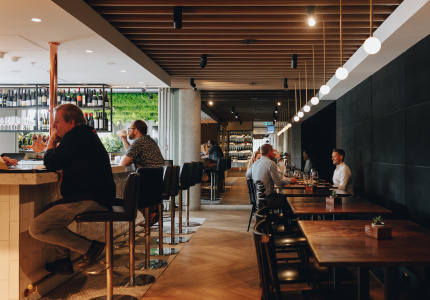 The six-foot three-inch Hills stands in a small open kitchen with a three-person brigade serving a $120 eight-course tasting menu (a five-course version is available on Wednesday and Thursday). It’s worth noting the team works a healthy four-day, 45-hour roster. Rather than calling it a “degustation”, the Japanese formats of omakase (“chef’s selection”) or kaiseki (a multi-course procession of ultra-seasonal dishes) might be a better description of the experience. After all, the concept for Hills’s restaurant solidified on a trip to Japan with wife Georgia. “In Japan, the person that makes the plates is as important as the chef, who’s just as important as the sake maker. Japan loves craft, they really respect craft and we don’t have that in our society now,” says Hills. While it's unfair to say that craft isn't respected in Australia, the holistic approach to design seen in Japan is rarer in this country. But rather than mourn bygone eras, Hills – who graduated RMIT with a bachelor of fine arts in drawing and ceramics – has taken his passion for craftsmanship and made it a vital element at Navi. For the past five months Hills has sat at a pottery wheel on his back porch, spinning the clay for every plate brought to your table. “I’ll be fine – as long as we don’t break more than four in a service,” jokes Hills –replacements “are about two weeks away”. On one ash-coloured plate, black blisters formed during the firing process where two custom glazes overlapped. The dish is home to a serving of smoked blue mackerel that’s been marinated in honey and white soy, and then aged for a week in beeswax. Saline beach greens cut through a dashi made with the fish’s roasted carcass and toasted tea tree leaves. Nori tapioca crisps crackle as the dashi – poured at your table – hits them. The dish’s sweet, umami-rich flavours are kicked into overdrive by a glass of warm Kenbishi Kuromatsu sake chosen by Turin-born sommelier Cristina Flora, who spent three years as a senior sommelier at the Press Club. The rice wine comes from the oldest sake brewery in Japan and smells of hard cheese and dried mushrooms. 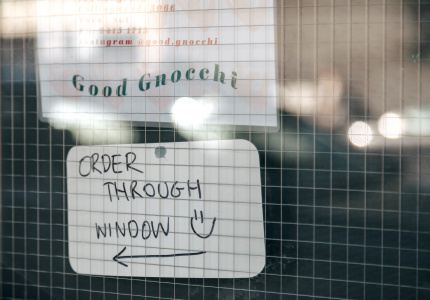 The flavours at Navi are undeniably Australian. In one dessert, full-cream cow’s milk is infused with strawberry gum leaves before it’s frozen into a sorbet. Sticky pectin – a starch found in fruit and vegetables – is released from tamarillo seeds as they’re cooked in a sauce, incrementally basting fresh quandong and more tamarillo. Those fruits are then sliced into leathery slivers to finish the dish. You can’t help but wish the tourists buying up opals and cane-toad purses on Swanston Street could taste this dessert. At Navi, you can touch the clay and taste the fruits of this wild country. A much better souvenir. Hills’s interest in native ingredients came into focus while working as head chef at Paringa Estate on the Mornington Peninsula. He collected a number of accolades during his six-year tenure, and also gained an education in native berries, tubers and edible flowers from Gunditjmara Kirrae Wurrung-Bundjalung man Lionel Lauch, who runs Living Culture, a non-profit focused on Indigenous educational programs including classes on bush tucker. “When I’m walking through a forest I’m looking at everything as edible now. It’s completely different,” says Hills. 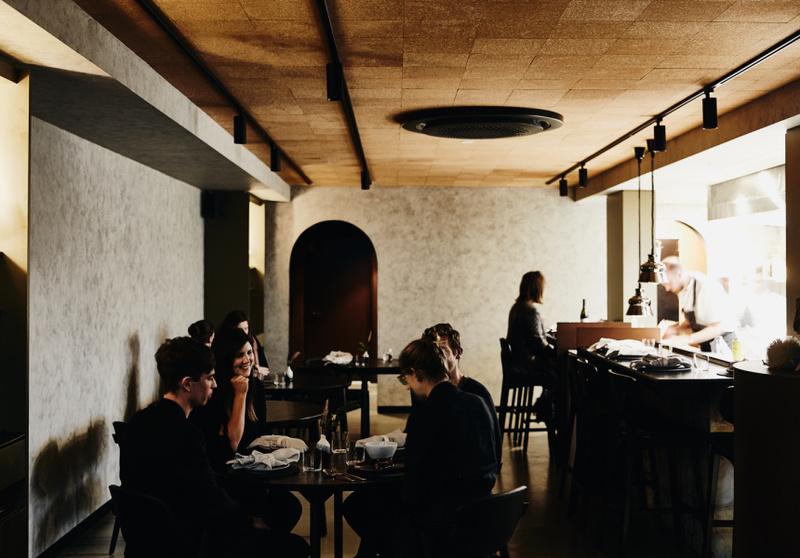 Hills’s older brother Damon, an associate director at Finnis Architects, designed the restaurant’s interior to reflect both the industry of Melbourne’s west, and the Victorian bush where Hills forages for many of his ingredients. The dining room, with its elegant charcoal palette, is intimate but far from stuffy. Nick Cave’s Red Right Hand plays on the stereo. “I wanted it to feel like earthy Australia ... with the background of the West Gate Bridge,” says Hills. Raw materials here are furnished with food, as well as stories. 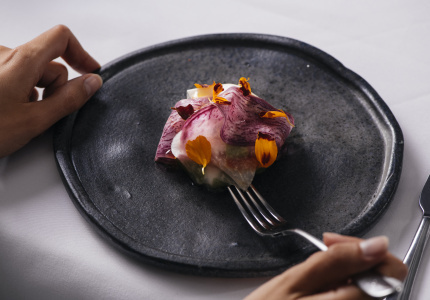 Wallaby tartare wrapped in a rolled sheaf of cured egg yolk, and a macadamia cream, native thyme and bush tomato tart are both served on a smooth vortex of carved jarrah hardwood. That piece of timber originally served as the steps to the Yallourn Theatre, a cinema in rural eastern Victoria, before making its way to the Hills’s family kitchen in the Strzelecki Ranges, roughly 130 kilometres south-east of Melbourne. Hills and his brother were raised there on a 40-acre hobby farm by their American parents Carolyn and Larry. Larry’s Cherokee heritage inspired the name of the restaurant. Pronounced “na-wi”, it means “local” in Cherokee. Despite growing up surrounded by food and produce, Hills didn’t get much of a go in the kitchen – that was the domain of his brother. 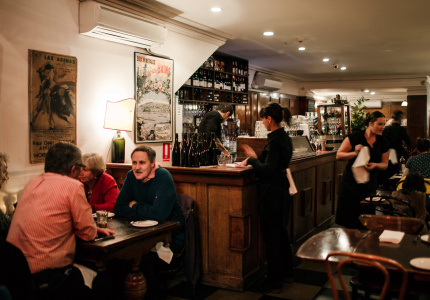 Hills discovered his interest in cooking later, while working the roast bar and experimenting with gravies at the old Myer Market Restaurant when he was 17 years old. He ended up in the kitchens of the Middle Brighton Baths Room, The European and The Courthouse Hotel before landing at Paringa in 2012. On days off, Hills still forages sea parsley and karkalla (a native succulent) from friends’ properties on the eastern side of the Mornington Peninsula.